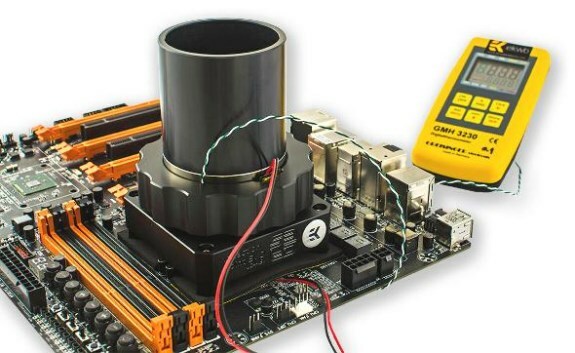 EK Waterblocks introduces the EK-SF3D Inflection Point EVO, the company's second product for LN2 cooling. This product promises to make LN2 cooling easier than ever before, for beginners and for experienced LN2 enthusiasts. EK-SF3D Inflection Point EVO is a high performance universal CPU liquid nitrogen evaporation cooler, the result of a joint venture between Petri 'SF3D' Korhonen, legendary overclocker and extreme evaporation cooler designer from Finland, and EK design & engineering team. The product is made of electrolytic grade nickel plated copper in order to provide the necassery mass to even out the temperature fluctuation. Excellent weight to surface area ratio ensures confident controll over temperatures. Precise and rapid response at any working temperature is what this product is all about - even when cooling the hottest CPUs on the market. Top extension is made from black anodized high quality aluminium alloy.